Listen to past HHMI President Dr. Thomas Cech discussing his Nobel Prize-winning discovery of RNA’s catalytic properties. A protein-folding simulation shows that the debated theory of long-term evolution is not only possible, but that the outcomes are predictable. The Stanford experiment provides a framework for testing evolutionary outcomes in living organisms. 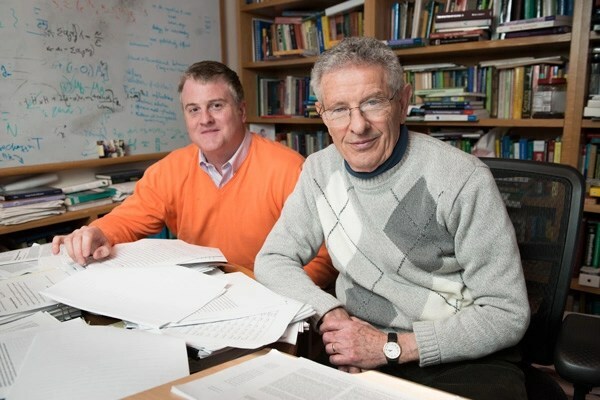 L.A. Cicero Dr. Michael Palmer, left, and Professor Marcus Feldman, with co-author Arnav Moudgil (not pictured), found that the long-term evolutionary dynamics were surprisingly predictable in a model of protein folding and binding. Two birds are vying for food. One bird’s beak is shaped, by virtue of a random mutation, such that it’s slightly more adept at cracking seeds. This sets the bird on the road toward acquiring more food, a better chance of scoring a mate and, most important, passing on its genetic endowment. This individual’s success is an example of short-term evolution, the widely accepted Darwinian process of natural selection by which individual organisms that have better adapted to their surroundings prevail. In recent years, however, some scientists have argued that natural selection occurs not just at the individual organism level, but also between lineages over the course of many generations. In a new study, Stanford biologists have demonstrated that not only is this long-term evolution possible, but that long-term evolutionary outcomes can be surprisingly predictable. The group set up a computer simulation in which 128 lineages of proteins continuously folded into new shapes, competing to bind with other molecules, called ligands, in each new configuration. The better each protein could attach itself to the ligands, the more ligands it would scoop up, and the higher its fitness – that is, its average number of “offspring” – would be. The simulation was run for 10,000 generations. Although the chaos of 128 lineages – a total of more than 16,000 individual proteins – mutating over thousands of generations might seem unpredictable, and that it would be nearly impossible for the same thing to happen twice, it’s actually the opposite. The study, co-authored by Marcus Feldman, a biology professor at Stanford, and Stanford research biologist Arnav Moudgil, was recently published in the Journal of the Royal Society Interface. A good example of this scenario is Darwin’s famous finches. It’s thought that individuals – perhaps just a single pair of birds – from a South American species ended up on the Galápagos Islands about 1 million years ago. Today their descendants have diversified into about 15 modern species. Some eat seeds, some eat insects, or flowers. Some eat ticks, or even drink the blood of other birds. The finding, and others like it, could represent a significant shift in viewpoint for biologists. For one thing, it means that in certain situations, scientists should look beyond the details at the level of the individual organism, as the evolutionary dynamics can be accurately understood as lineage selection. It also has implications on a species’ genomic architecture, or how a genome is organized on the lineage level. While a lineage’s genome might primarily select for a particular set of traits in order for individuals to survive in the short term, in order to out-compete other lineages, it must also be able to adapt to new conditions over the long term. The authors believe that the work can be replicated in microorganisms, and are now hoping that microbiologists will apply the new metrics of selection in vitro. As part of an ongoing and proactive effort to monitor food safety and address contaminants in food, the U.S. Food and Drug Administration today released preliminary data on arsenic levels in certain rice and rice products. The data are part of a larger FDA data collection and analysis about arsenic levels in rice and is based on the first set of approximately 200 samples of rice and rice products collected in the U.S. marketplace. The FDA is in the process of collecting and analyzing a total of approximately 1,200 samples to examine the issue thoroughly. This data collection will be completed by the end of 2012. Once the data collection is completed, FDA will analyze these results and determine whether or not to issue additional recommendations. Based on the currently available data and scientific literature the FDA does not have an adequate scientific basis to recommend changes by consumers regarding their consumption of rice and rice products. There are two types of arsenic compounds found in water, food, air, and soil: organic and inorganic. Together, the two types are referred to as total arsenic. The new data show how much inorganic arsenic the FDA found in its initial samples, which include various brands of rice (non-Basmati), Basmati rice, brown rice, rice cereals (puffed, non-puffed, hot cereal, and infant cereals), rice cakes, and rice milk. The FDA’s analysis of these initial samples found average levels of inorganic arsenic for the various rice and rice products of 3.5 to 6.7 micrograms of inorganic arsenic per serving. Serving sizes varied depending on the rice product (for example, one serving of non-Basmati rice was equal to one cup cooked). A summary of the initial 200 sample findings can be found at www.fda.gov4. While the FDA data is consistent with results that Consumer Reports published today, the initial data collection is a first step in the agency’s ongoing more thorough data analysis. There are many different types of rice and rice products that are grown in different areas and under different conditions. Further analysis is needed to assess how these variations may affect the results.